“Don’t you ever quit, Immel,” Sam Fees screamed. “Don’t you ever quit in the middle of a race. It’s weak and it’s cowardly and disrespectful. Don’t be a quitter!” I was thirteen when I quit running 75 yards into a 100-yard dash. When I saw the kid in first place had me by 10 yards I bailed. “What’s the point” I thought. Sam Fees, my eighth-grade teacher, taught me an important if embarrassing life lesson. I wasn’t much of an athlete but wanted desperately to be one. From sixth grade through high school I tried to make the team in almost every sport. Except for basketball for some reason. Jocks sat at the head of the table at Tempe Union High School during the fifties I can tell you that. Being a jock and being a BMOC were synonymous. Despite my meager efforts on the field and on the track, I existed on the periphery of the cool kids, not quite in but not out either. I was invited to the right parties but never felt part of them. It felt like I was looking in from the inside. In a pod within the sphere of the chosen ones. High school is a fraught time for lots of kids and I would best describe my time as bitter sweet. First loves, in my case unrequited, the lack of success in sports and a checkered academic career constructed self-doubt that wasn’t erased until college when I grew into my body and started connecting with girls. I was a late bloomer who should have been redshirted in high school. I wonder how high school might have been if I’d been a year older all along the way. I wasn’t just emotionally immature but a total pencil neck through my junior year. I entered the summer of 1958 as a 5’-11” 128-pound scarecrow. That’s the body I brought to the gridiron with predictable results. Slow, skinny and clumsy is a deadly combination. In my freshman year Coach Chief Wynn gave me a crack as the starting halfback, so I promptly twisted my knee and he relegated me to the defensive line. A 120-pound tackle heaven forbid. Tempe High was a jock school. We had great football teams that starred guys who went on to play major college football and made my chances slim and none. All-State Running backs Larry and Rob Royce played at Stanford, for example. They were also state champions in the 100-yard dash in successive years, 1958 and 1959. Determined to finally make the varsity football team I committed myself to put on weight and give it a real go my senior year. I drove to Phoenix every other day to work out at a gym on North Central Avenue, one that was used by the best footballers in the Valley. Among them were the national record holder in the shotput Dallas Long and his North Phoenix High School mate, Karl Johnstone, the national champion in the javelin. These guys were behemoths and I was a twerp. Surely, I’d gain weight and coordination by osmosis. Between May and August with grueling workouts and prodigious quantities of Hoffman high protein shakes I weighed 168 when football season started. Coach Wynn allowed that, “At least you’re big enough to play.” Big enough does not mean good enough. I was demoted to junior varsity as a senior. It still smarts. My only letter was in golf. Laugh line. My best friend John Ellsworth, Jimmy Oakley and I bought clubs, mine were Wilson Sam Snead Blue Ridges, and all of us went out for the team. In the Phoenix area you can play golf all year round so we played every single day. Tempe didn’t have a golf course but we had the rights to play at South Mountain in Phoenix and that became our home course. John and I were dogged about learning the game. In our senior year we were the third and fourth players on the squad. I can’t tell you who was which. And we weren’t half bad for newbies. Both of us shot in the low-eighties and I had one 79 with a little help from my right foot. In the dry and hot weather you can hit the ball a mile. I routinely drove 300-yard greens. The ball would roll forever. My short game was another matter. My opponents would play mind games like, “If I could drive that far I’d par for sure.” The pars came sparingly, of course. I was easily frustrated, quick to anger and was a noted club thrower. In my sixties I revisited golf as I had once a decade since high school. The teaching pro at a driving range in Waltham, Massachusetts told me, “You have the fastest swing I’ve ever seen. If you could slow it down a little you’d be dangerous.” She suggested a Nano second pause at the top of swing to gain some control. Didn’t happen. One time I was playing a golf game with my business partners and James Boyce, our marketing guy and a three handicapper. James was an entitled prick but sure knew his golf. He told me, “You’ve got something that not very many amateurs have. You have pretty swing and it’s the same every single time. You could be a good golfer if you played enough.” Hey, where’s the fun in doing something you’re actually good at? It wasn’t until I started running in March of 1976 that I flashed a glimmer of something athletic. It was the height of the running boom. 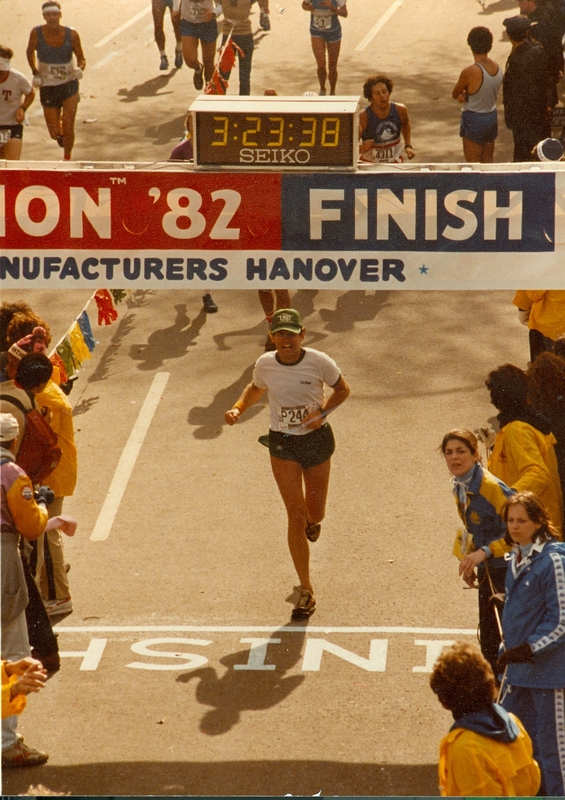 Frank Shorter had won the marathon at the Munich Olympic and Bill Rogers, who came in second, sparked a distance running craze. Ever the early adaptor, I became part of the boom and running became a constant in my life. I had minimal athletic talent but was able to fashion some success through persistence. I was a plugger. As I have reported, my first running steps as an adult human being were taken in New Canaan, Connecticut. At first, I could run precisely .8 of a mile before I’d be bent over double in the spasms of oxygen depletion. I would walk around the intersection and pant back to our house at 312 Mariomi Road. Two months later in May I summoned the nerve to try to run five miles. You’d have thought it as an ultra-marathon. I even enlisted Peggy to drive the ambulance I was sure I’d need. So, on July 4th of 1976 I ran my first 10K just over the Hill in Wilton. I finished in 52 minutes or so, a little over eight minutes per mile. I was the king of the world. The hook was set. I was and still am a runner. Folks define themselves by what they do for a living. With running such a part of life, I began to call myself a restaurant operator and a runner. Today I say I’m a writer-photographer and, still, a runner. Note that "writer" preceded photographer. I ran dozens of 10Ks after my maiden voyage in 1976. My times decreased through 1987 when I did a 38:51 on the running leg of the New England Triathlon series event in Bridgton, Maine. I was 46. After that my time slowed every year till I ran a 50-minute 10K in Berlin, New Hampshire in 2006. I had just turned 65. I haven’t run a timed race since but wouldn’t rule it out. Along the way I ran one Marathon. The New York Marathon in 1982 was glorious. Gunnar Nilsson and I trained together in Columbus, Ohio. We did a 20 miler two weeks before New York. That was the key element of Jeff Galloway’s ten week training plan in which you’d average 50 miles a week for ten weeks culminating with the 20-mile run and a taper the last two weeks. That run was notable because I did a face plant and scraped the hell out of my right knee. There was no lasting damage save some soreness. When Gunnar and I met in Manhattan we abided the pre-race protocol of carbo loading but pushed the limits of alcohol intake the night before. Where, you ask, did we partake of our icy ales? P.J. Clarke’s, don’t you know. We took busses to the start of the race on Staten Island and gathered at the bottom of the Verrazano Bridge to await the starter’s gun. With 8,000 runners, it’s 40,000 now, it took me eight minutes just to get to starting line. It was slow going over the bridge but on the downhill entering Brooklyn I hit my stride. A tour of Brooklyn, Queens and Manhattan at a runner’s pace is revelatory. A runner’s eye view of New York’s neighborhoods and cultures is an intimate look at the vibrance and diversity of a great city. I will never forget the feeling I had as I ran down the 59th Street Bridge at the 16-mile marker. That view of the Upper East Side of Manhattan and the din of cheering onlookers as I came off the bridge and turned right onto First Avenue was pure, unfettered joy. Coming off the long descent into Manhattan and buoyed by cheering crowds I felt like a could run forever. I felt the unfamiliar feeling of speed. I was the wind. I was fast. After the gritty cityscapes of Harlem, I turned south into enter leafy Central Park where I had run dozens of time. The course stiffened. The rolling terrain makes for a hard-fought last six miles, but I was so pumped that I finished the race at my fastest pace of the day. I passed half a dozen runners on the finishing straight. I do believe I was sprinting. It was a highlight of my life. I crossed the finish in 3:27:38 or a 7:47 per mile average. I was exhilarated and depleted and swore I’d never do it again. And I’m a man of my word if nothing else. Your words have been pouring forth and meeting the computer in a most delightful way and at a rapid pace. It is, once again, wonderful to look through the many windows of your life and see how you were formed over the years. Truly, how many men and women yearned for popularity through sports, only to have hopes dashed at one point or another. But being a late bloomer myself, I understand how, when you found your passion, you embraced it and it never left. Athletic abilities, developed over time, are the best, and that is something you have done, Steve. Screw high school, collegiate, and pro teams. YOU are a runner and will be one for life. Can't get much better than that! Another great blog!